Born on November 18th, 1901 in Jefferson, Iowa, George Horace Gallup’s early life was spent on the family dairy farm. From an early age, he demonstrated an aptitude for business and journalism; excess profits from the family farm were spent to fund his high-school newspaper. Gallup attended the University of Iowa, graduating in 1928 with bachelor, master, and doctorate degrees in journalism. He married his wife, Ophelia Smith Miller, in 1925. Together, they had three children: Alec Miller Gallup, George Horace Gallup Jr., and Julia Laughlin Gallup. 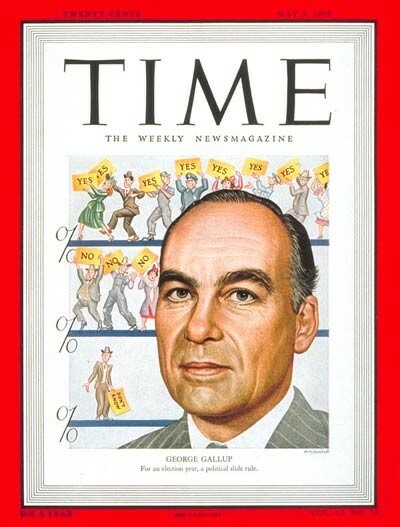 Gallup’s post-graduate life was marked by a fascination and talent for journalism and polling. From 1923-1929, he taught his fellow peers at the University of Iowa. From 1929 to 1931, he was head of the Department of Journalism at Drake University. He continued similar positions at Northwestern and Columbia through the Great Depression. 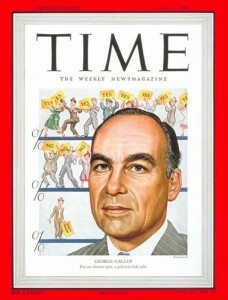 After a stint at the advertising agency Young & Rubicam, Gallup established his very own polling group: the American Institute of Public Opinion, which after his death changed to the Gallup Organization. This group dramatically reshaped the study of demographics and statistics, providing daily polls with up to date information on everything from Presidential elections to unemployment and consumer satisfaction. Since its founding in 1935 in Princeton, NJ, Gallup Polling has been a leader in both the United States and abroad at procuring opinion polls and analytics for almost any problem at any level. Gallup polls are common staples in American presidential elections, Congressional elections, the passage of momentous or run-of-the-mill legislation, and more. 350 days a year, Gallup polls 1,000+ across the United States on health, wellbeing, political stances, and more. Gallup has, with few exceptions, been consistently ranked to this day as an industry leader in accuracy, depth, and transparency in its polling.